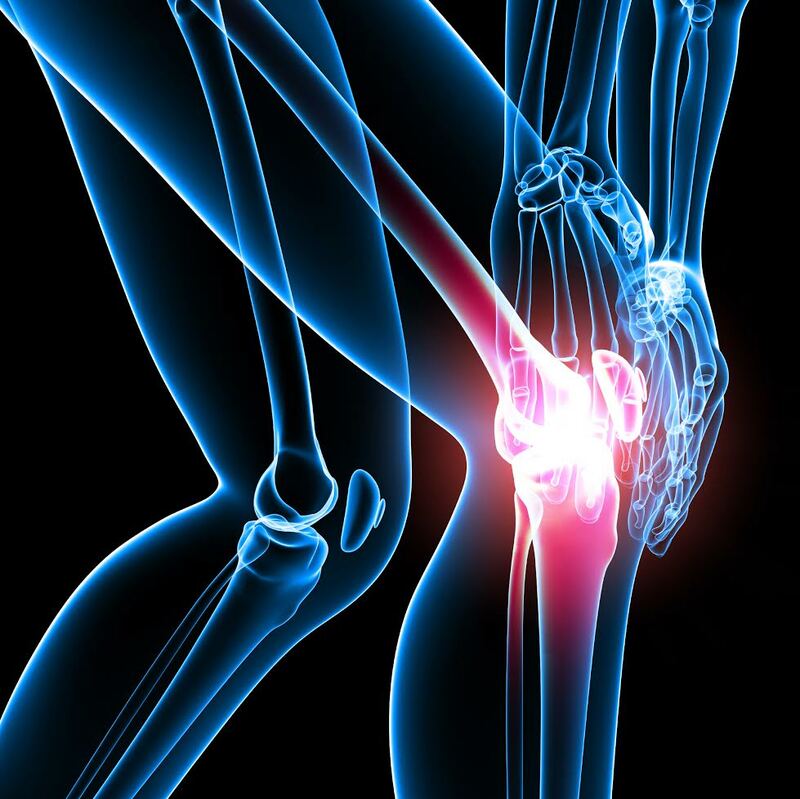 Although the knee may appear like a simple joint, it is the most complex joint in the body. The knee is also more likely to get injured than any other joint of the body. If you take care of your knees now, before a problem occurs, you can prevent pain and disability. rides on the knee joint, protecting it from injury. When you move your knee, it flexes (bends) and extends (straightens). The knee also has a slight rotational component to the motion. The knee muscles that go across the joint are the hamstrings and quadriceps. The hamstrings run along the back of the knee, and the quadriceps are on the front portion of the knee. The ligaments hold the knee joint together. While the bones support the knee, and give structure to the joint, the muscles move the joint. Finally, the ligaments stabilize the joint. The meniscus is a C-shaped piece of cartilage that lies between the tibia and femur. This meniscal cartilage helps protect the joint and lets the bones slide freely against each other. The bursa surrounds the joint, and it has a fluid sac that allows tendons and muscles to move freely as the knee joint moves. For the knee to function well, it must have flexible and strong muscles. In addition, the cartilage and ligaments must be strong and smooth. Any problems with these knee joint components can produce pain. There are two cruciate ligaments at the center portion of the knee. 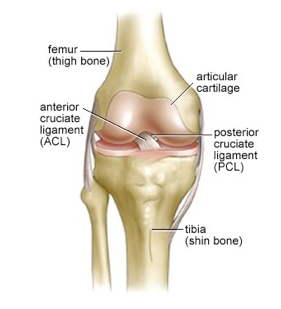 The anterior cruciate ligament (ACL) and the posterior cruciate ligament (PCL) are the main stabilizing knee ligaments. Both ligaments stabilize the knee. If either of these ligaments is damaged, the knee will be unstable when putting the foot down and pivoting. 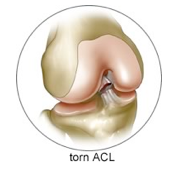 A damaged ACL or PCL will cause the knee to give way (buckle). The medial collateral ligament (MCL) and lateral collateral ligament (LCL) also stabilize the knee during side-to-side stress. The medial and lateral menisci are located between the joint, and they work with the ligaments to provide support and stabilization. Menisci function as shock absorbers in the knee joint. Patella tendinitis – This injury follows overuse or results from repetitive trauma to the extensor mechanism. Patients will complain of pain at the front of the knee, which is associated with swelling and limited flexion. Quadriceps tendinitis – When the quadriceps tendon becomes irritated and sore, it will cause pain and tenderness right above the patella. Bursitis – The bursae are synovial-lined cavities that lie over a boney knee prominence. Repeated trauma or overuse can lead to inflammation within the bursa. Bursitis is also related to repetitive activities, such as running. Patellofemoral pain – This is pain at the front of the knee from chondromalacia, patella malalignment, osteoarthritis, synovial plica, or patella instability. Anterior cruciate ligament injuries – ACL tears are quite common, with 250,000 cases reported each year in the United States. This injury occurs when the foot is planted and the knee twists. Posterior cruciate ligament injuries – PCL injuries are less common than ACL tears. This injury often results from a fall onto a hyperflexed knee when the plantar foot is flexed, as in a dashboard injury during a motor vehicle accident (MVA).